The brand Kitiwaké defends an ethical model about sport, well-being, fashion and nature. 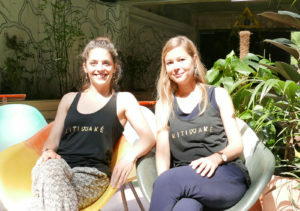 The two designers Juliette and Cannelle share the same passions: yoga and nature. Both of them have an expertise in creation and management, that’s why, they decided to launch a new brand in this rewarding adventure. The importance of nature in their creation is essential, indeed, their pieces use natural and sustainable fabrics and materials. They also include a social ethic in their way of production which are made in a Parisien workshop. ” Kitiwake” means a seagull who walks in a far north. Kitiwake is a meeting between yoga, the big North and Paris.